Mushrooms are plants. They occupy a unique position, however, in the vegetable kingdom. It might be said of, these " children of earth " that they toil not, neither do they spin, inasmuch as they take no part in the busy life of the plant world. They must depend for their sustenance on the efforts of other plants. They develop no flowers or seeds, but reproduce by means of spores, which germinate if the peculiar conditions essential to their growth are present. Our illustration shows an edible form of mushroom whose beautiful colors contradict a prevailing idea that the highly colored forms are poisonous. 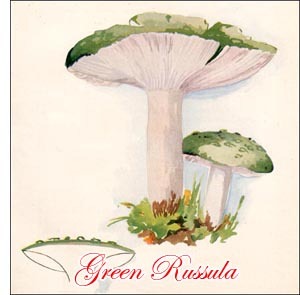 The plant is known as the Greenish Russula. It can hardly be called green; greenish-gray better describes it. The top is dry and has upon it small warts or patches of the characteristic color. It is at first rounded, then flat, and later may become centrally depressed. It is usually thin and smooth at the edge, marked there with short lines following the direction of the gills. Old specimens will occasionally split at intervals along the edge. The gills are white or nearly so, and are very fragile, being shattered by a slight blow. They are narrow near the stem, hardly reaching it. The flesh is firm and of a creamy-white, the spores being white. The stem is thick, solid, and rather short. It is not surprising that forms exhibiting such a variety of color and form and mystery of development should have become a subject for myth and story. Mushrooms are responsible for the fairy rings so often noticed in pastures. They were thought to be formed by the dancing feet of the fairies, but science comes along and replaces the fancy by cold facts. A mushroom soon exhausts from the soil the food necessary for its growth. Hence its spores must fall beyond this depleted area in order to germinate, and by so doing a ring of toadstools is formed. When they decay the ground becomes fertilized, causing the grass to spring up along the line of the ring with greater luxuriance than elsewhere.